Nikola Jokic anticipates the double-team for your Heads Up Play of the Day! From ping pong matches to shooting around, here is Nikola Jokics fun pre-game routine! Check out the best moments from Saturday's Playoff action. Derrick White scores a career-high 36 points on 15-21 shooting, DeMar DeRozan adds 25 with five assists as the Spurs take Game 3, 118-108. The GameTime crew reacts Nikola Jokic's triple-double and discuss if he needs to be more aggressive in Game 2. “An assist makes 2 guys happy, a point makes 1 guy happy..it’s as simple as that!” check in with Nikola Jokic as he explains his journey in the NBA! Selected by the Denver Nuggets in the second round (41st overall pick) in the 2014 NBA Draft. 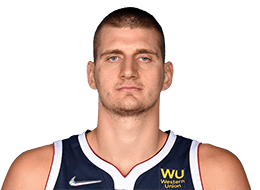 2013-2014 Season: Jokic is only 19 years old and showed great development in his first full season in the Adriatic League after playing for his club junior team most of the 2012-13 season. He shot over 60 percent on two-point FGs and displayed nice touch around the basket. He scored in double figures in 17 of his last 21 games.